Weighty Matters: Does this vending machine really contain healthy choices? Does this vending machine really contain healthy choices? A few weeks ago a story out of Toronto had nutritional lug nut and Toronto City Councillor Doug Ford angry at the city for "force-feeding" kids "healthy" beverages. 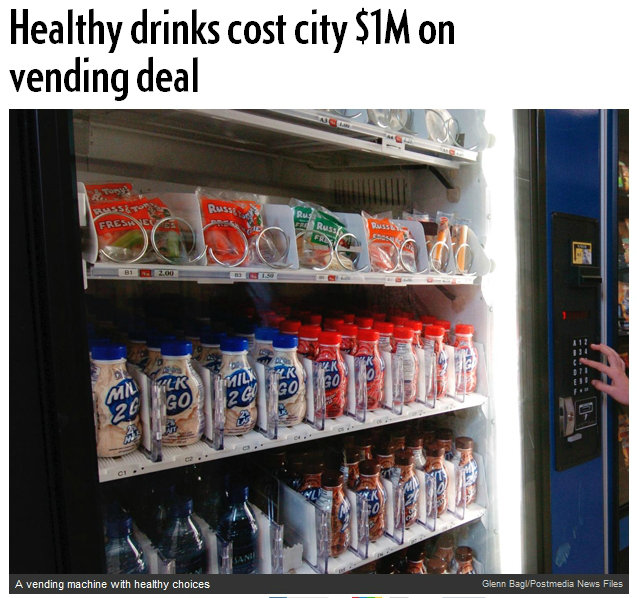 He was angry because City vending machines weren't generating as much profit as he'd like since the watered down plan of replacing half of the "unhealthy" beverages with "healthy" ones. But the real story for me came from an accompanying piece from the National Post. Headlining the piece? The photo up above of the "healthy" beverages. Milk2Go, and while yes there's plain milk in there, I also spy sugar sweetened chocolate and strawberry splash. Comparing those "healthy" sweetened milks with sugared soda? Milk2Go's flavoured options contain 60% more calories than Coca Cola and have an equivalent amount of sugar. If this plan that Doug Ford so loathes was meant to get sugar sweetened beverages out of City vending machines, why are they still there?